How to Calculate Fabric Consumption of a Garment? Like other business, garment factory is set for profit generation. Profit can be improved by saving from each cost factors of garment making. The fabric is most important constitute of a garment and it represents around 60-70% of total product manufacturing cost. Fabric cost of a product depends on how much fabric is consumed to make the garment including cut wastes and end bits. So fabric consumption must be calculated accurately. Most of the Indian apparel factories fabric consumption is made by pattern masters. Rest of the employees do not bother how it is done. If you have product technical sheet then you can calculate the exact fabric consumption of a garment. Average fabric consumption also depends on nature of the fabric, like tubular or open width fabric. Whether fabric is solid colored, check or stripe or any specific design repeat required. In following one example has been shown with a formula for better clarification about the calculation. To estimate fabric consumption for a knitted top use following formula. Example: Product - knitted top. Garments components are front, back, and sleeves. Note: The above formula will give you weight of fabric only that is consumed by a garment. In the above formula, I have not included fabric loss due to fabric width, marker loss and fabric wastage (such as end loss, end bits, defects). 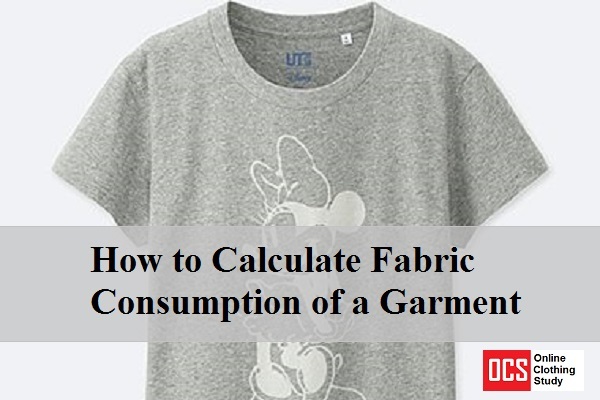 When you purchase fabric you have to consider all of these parameters in fabric consumption calculation. To use calculation sheet download the following file. Online Clothing Study: How to Calculate Fabric Consumption of a Garment? Fabric Consumption calculation method and formula for knits top.